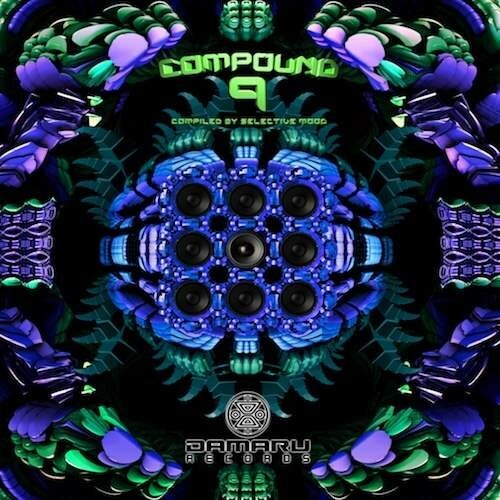 Damaru Records brings to you with “Compound 9” a fresh, eclectic blend of darkpsy and hitek tunes that is compiled by Selective Mood from Austria. Ataro opens this compilation with his elaborate, classic darkpsy style. With this promising opener the people must obey and dance.Nano Bugz & Nocturnes Creatures investigate the realm of deep and dark atmospheric psytrance. Beyond that Bombax, Organoise and Nyama focus their tracks on the more hitek side of psytrance. Groovy basslines, thundering leads and dynamic sound structures overwhelm your heart. Antagon, one of the main heads of Damaru Records, presents to you his vision of ecological genocide and brings to life the destruction of nature through technology. After the genocide, Vector presents his projection of the apocalypse. Finally, Hyzek finishes this compilation with a fast and hard-hitting yet light-hearted track at high speed. In this final chapter, hitek basslines meet crazy voice samples and glitches.